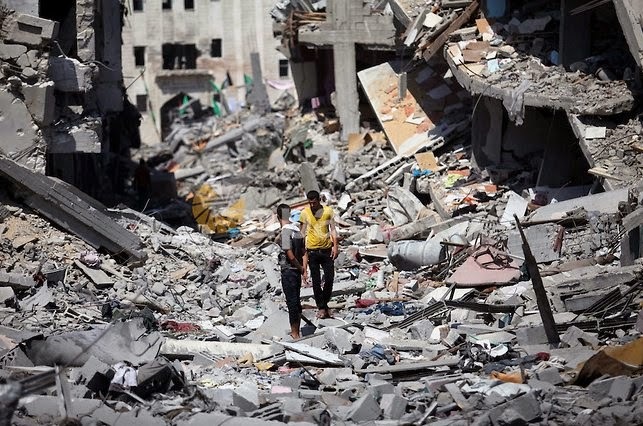 It's possible the carnage and destruction that Gaza has endured under Hamas is over for now. Or not: tonight's reports indicate the Hamas leadership - most of them based away from Gaza in luxurious accommodations - are ready, willing and very publicly anxious for more. See "Hamas rejects Egypt ceasefire terms, vows ‘continued struggle’" [Times of Israel, August 16, 2014], as a vivid illustration. Against that background, we're still waiting for mainstream reporters and their editors at major news-industry channels to finally be upfront and open (i.e. to do what their professional code of ethics requires them to do) about what is known of the Hamas battlefield strategy, in particular as it pertains to (a) Gaza civilian casualties versus combatant casualties and (b) the appetite of the jihadists for more and more and more. [Hamas] field commander Abu Jihad told Al-Monitor, “Israel’s allegations that it destroyed the tunnel network are inaccurate and aimed at local consumption to reassure Israelis that the war was progressing well. To determine the truth, all they have to do is embark on a wide-scale ground offensive in Gaza, for we have prepared a wide array of tunnels 5-25 meters [16-82 feet] deep, which allow our fighters to move about the battleground undetected. ...Hamas’ military wing, the Izz ad-Din al-Qassam Brigades, demonstrated resilience against the Israeli army in the Gaza Strip in the latest war, and their officials say they still have the military capabilities to continue the fight. It is interesting to note that, in this war, unlike the previous wars in 2008 and 2012, the al-Qassam Brigades [i.e. Hamas] did not divulge the names and numbers of its dead, nor did they allude to them in any way, except through unofficial activist posts and pictures on Facebook. It is well known, however, that they number in the dozens, with medical sources in Gaza confirming to Al-Monitor that corpses in uniform were brought to hospitals. ...Rescue workers were still removing the bodies of fighters and those who died when Israel targeted their homes in various areas of Gaza, without any mention of the approximate number of martyrs. Some fighters who went on patrol have yet to return home, because it was only logical that dozens would fall in this confrontation where Israel targeted homes. So - a Hamas source that says Hamas is hiding its combatants, hiding its casualties, hiding the strategic tunnels (some of which are known to be underneath Al-Shifa Hospital) and ready to keep fighting irrespective of the price paid in human lives and desperation of the powerless Gazan population whose lives are controlled by the Islamists of Hamas. Do the dots have to be joined before information of this kind [and this kind too: "Top 9 facts the media wouldn't tell you about Hamas"] appears in our major newspapers and evening news programs? UPDATE 12:40 am Sunday: See What Happened to the Press in Gaza?, Jonathan S. Tobin, Commentary Magazine, today. If a person paid careful attention, he would realize that Hamas had a whole network of tunnels within Gaza, and the only tunnels destroyed were the ones leading into Israel. The tunnels within Gaza were not being mentioned lately. (Hamas and others also had tunnels leading into Egypt) Also not every tunnel leading into Israel may have bene found.